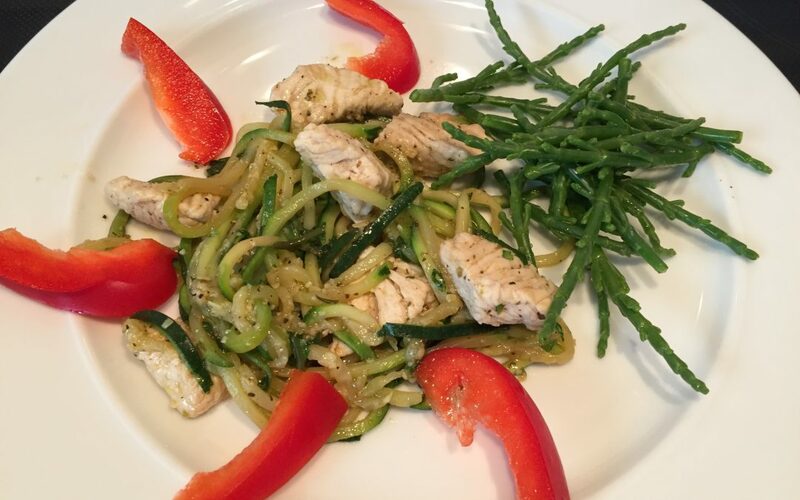 Don’t you just love the word zoodles? Have you ever attempted making these zucchini noodles yourself? Ever since discovering the idea of spiralized vegetables I thought it was a fantastic idea and yet, I was skeptical about the process of making them. I’d seen hand-held spiralizers that never managed to convince me. 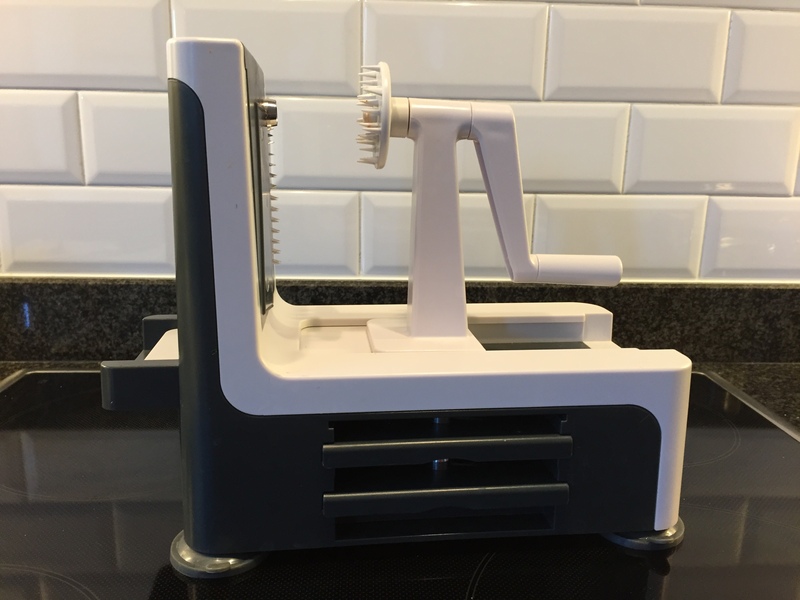 I’m happy to share that I have found a spiralizer that’s not terribly big, it’s quite light and yet more sturdy than a hand-held device and it works great (see the picture below). To get started I recommend using zucchini because they are soft. Once you get used to using the spirilizer you can also use sweet potatoes, carrots or parsnips for example. Wash the zucchini, cut of the piece they were attached to the plant with and put them through the spirilizer. 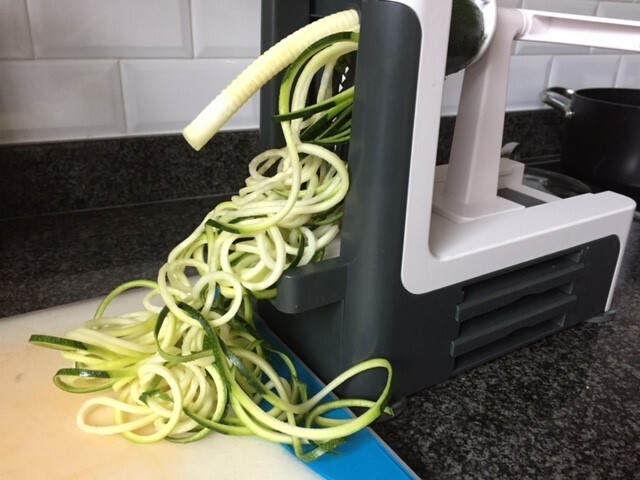 With a knife or scissors, cut the zoodles to a manageable length. When they are too long, it’s not only harder to eat them but also to mix them with the rest of the ingredients. Cut the onion and garlic into small pieces and the turkey meat into bite size chunks. Heat some coconut oil in a big pan with high sides. Add the onions and the garlic, fry until the onions go transparent. Add the turkey meat and fry until lightly browned. Season with salt and pepper (and garlic powder if you didn’t use fresh garlic) and set aside on a board (I often skip this step and add the zoodles straight to the meat). Add the zoodles and the samphire (if you prefer it warm) fry for a few minutes, taste them to see how al dente you like them before adding the meat back into the pan. Season with Italian spice mix and some fresh basil leaves. Last but not least add some olive oil and Parmesan cheese to your taste. I added the samphire raw on the side as well as some raw red pepper to add an extra colour.